Woodcut by Jorg Breu the Elder. Taken from ‘The Book of Emblems’ by Andrea Alciato. (1531). There is no doubt that the study of astrology is fascinating. This particular astrologer in his wonderful medieval garb is depicted as looking upwards, entranced by the magnificent night sky containing a waxing moon and brightly shining stars. The image clearly shows that his head (and thoughts for that matter) are well and truly up in the clouds for the heavens surround it. He is intent, lost in the spectacle overhead. The night is ruled by the moon and the night is the reflective part of the daily cycle where our emotions and intuition are given full reign. These are lunar qualities and there is little room for solar logic here. The astrologer points directly to a particular star – we know not which one. Could it be a malefic star he has noticed? We can only surmise. But it is conjunct the moon, traditional co-significator of the body. Completely absorbed with the celestial, our astrologer pays scant regard to more pressing matters, namely the terrestrial. If we look at the earth upon which he treads we can see that his right foot is about to trip on a stone. He will soon take a tumble, see stars of a different kind and his attention will switch to more mundane matters when he goes down with a bang. The moon conjunct a malefic star? That sounds about right! Claudius Ptolemy (1) tells us that ‘…prognostication by astronomical means is possible, and that it can go no further than what happens in the ambient and the consequences to man from such causes’. According to him this knowledge is ‘conducive to well-being, pleasure, and in general satisfaction’. So it would seem that this message of forewarned is forearmed is being pictorially delivered but unfortunately not adhered to. Ptolemy elaborates further by telling us that astrological knowledge ‘accustoms and calms the soul by experience of distant events as though they were present, and prepares it to greet with calm and steadiness whatever comes’. Will our soon to be falling astrologer agree with this statement? Who or what will he blame? In the great astrological tradition the right and left sides of the body are ruled by the sun and moon respectively. The sun is of the dynamic, active principle whereas the moon is passive and receptive. 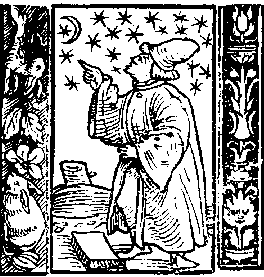 A look at the woodcut hints that it is the astrologers right hand and foot that cause his pending misfortune. In this receptive night environment it is the solar half of his body that is leading him on – his right hand points upwards as his right foot moves forwards. This gives him an almost chastising pose against the moon and stars. His left hand is downwards, a passive gesture and his left foot is behind him waiting to move. The emphasis on the right hand side indicates a conscious choice to understand the universe rather than passively surrender to its mysteries, its wisdom – the stars do come out at night and after all. In this lunar landscape the astrologer’s decidedly solar stance is quite literally out of step with the environment. This might be the cause of his fall. We can read this image in many ways (and this is only one interpretation after all). It offers more questions than answers but more interestingly, isn’t the astrologer exactly where the stars dictated him to be in the first place? I leave you to ponder. Let us return to the woodcut informing us that events can befall us quickly. It also serves as a reminder that although the stars foretell our fate this knowledge is useless if we don’t apply it. We must pay attention to what is going on around us, in heaven and on earth. They are connected and part of the same universe. This idea is perfectly captured by the old adage ‘as above, so below’ ascribed to Hermes Trismegistus, allegedly mankind’s first philosopher and the one who traditionally gave us astrology in the first place. ‘We are all in the gutter, but some of us are looking at the stars’ (2) could well have been written as some kind of astrological mantra or oath. While it is true that the planets give indications to help us in life, we must use this precious knowledge carefully, appropriately, with a pinch of common sense thrown in for good measure. (1) Claudius Ptolemy. ‘The Tetrabiblos’. Book 1, chapter 3. That it is also Beneficial. (2) Oscar Wilde. “LadyWindermere’s Fan”. (1892) Act III as spoken by Lord Darlington.